You gotta love this one – Start with a pig part, add bold, fresh flavors and ta-daaaah! Very impressed dinner guests! I used this recipe for our very first dinner guest of 2012 making it up as I went along, and served it alongside my Pumpkin & Mushroom Risotto and Roasted Brussels Sprouts. When our guest, Brian (no relation), arrived, the roast and Brussels sprouts were in the oven, and I was just finishing the risotto. As I stirred in the pumpkin, butter and cheese, Orville whipped up some killer margaritas for our guest. The kitchen smelled amazing, and we were all stoked to be sharing this evening together. I took the roast out at a perfect medium-well (I took it out at 155º, which rose to almost 165º as it rested), tented it in foil and picked up my margarita to join in the fun. Brian (not me, the other one) asked what the menu was and I told him all about this super flavorful crust on the pork loin roast, the risotto–slightly sweet and earthy with pumpkin and mushrooms (which I like to top with truffle oil), and the super simple roasted Brussels sprouts. Brian grimaced coyly at the mention of these misunderstood orbs, and sheepishly admitted that he’d never really cared for Brussels sprouts. ACK! I never even thought to ask. Not everyone shares my Ohio-farm-born lack of food prejudices, and the sprouts de Brussels are particularly polarizing. I’m the WORST. HOST. EVER, I thought as I swigged my margarita, grateful for Orville’s tendency to have a heavy hand with the hooch. “Oh… um…'” I stammered as I’m sure my face betrayed my plunging self-esteem. “But I’m sure I’ll love these,” Brian added gamely. He was well raised and a very good guest, god bless him. “Oh, no… you don’t have to. I’m sure I have something else I can whip up.” I glanced at the thermometer sticking out of the foil-clad roast – 164º and perfectly rested, risotto perfectly creamy, and the sprouts due to come out of the oven in 60 seconds. Everything ready at the anointed moment. What could I make fast enough that it wouldn’t require salvaging gloppy risotto or somehow reheating a roast while not overcooking it? I was pretty sure I had NO OTHER VEGETABLES in the fridge, so I reached for the freezer. “Really, it’s fine. They smell wonderful,” Brian said in a sincerely reassuring tone that pulled me out of my nose dive. I took a breath, a sip of margarita (thank you Orville), and slipped on an oven mitt as I opened the oven door and took out the perfectly charred and caramelized sprouts. “Oh, I’ve never seen them like that. They look amazing.” Indeed they did, and we loaded our plates and heading to our makeshift dining table (which is sure to be the subject of a Tiny Kitchen Tip in the near future). Minutes later, there was not a speck of green (or anything else) left on Brian’s plate and the world had another Brussels sprouts convert. I’ve already posted the other two recipes, so this makes the final installment in the 2012 Dinner Party 1.0 series. It’s a winning combination, and I included the timing of this whole menu at the end if you want to do the same, so everything will be ready at the same time! Season the roast with salt and pepper. Refrigerate for 1 hour, or up to 8 hours. Preheat your oven to 450º F. It’s important that it’s really this hot, so be sure to preheat for at least 10-15 minutes, and check the temp with your oven thermometer. Place the roast fat side up (if there is ay side) in a small roasting pan or cast iron skillet. Let sit at room temperature for 15 minutes. Put all the ingredients for the crust into a food processor [Note about the orange: peel it by cutting the top and bottom off, then slicing off the skin so that no white remains on the outside. Quarter the orange and add to the processor.] Process for 30 seconds and transfer to a measuring cup. Put the roast in the oven on a middle rack. Roast at 450º for 15 minutes, then reduce the temperature to 350º F and roast for another 15 minutes. Remove the roast and generously brush the top and sides with the crust mixture. Return to the oven for 15 minutes. Remove the roast and increase temperature to 450º again. Apply another layer of crust mixture. Continue to roast at 450º for 10 minutes. Check the temperature. You want to remove the roast when it reaches 155-160º F, so keep an eye on it. When the roast reaches 155-160º F, transfer it to a cutting board, tent with foil (avoid letting the foil touch the crust) and allow to rest for 10-15 minutes. DO NOT SKIP THIS STEP! 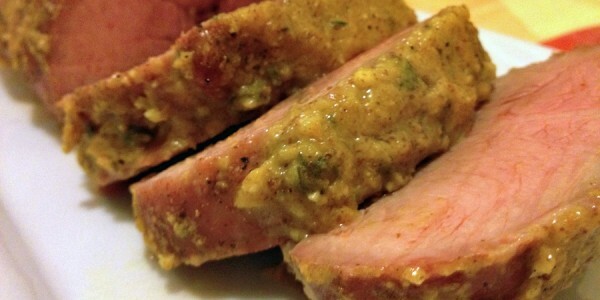 Slice and serve the juiciest, tastiest pork roast you’ve ever had! I love this with my Pumpkin Mushroom Risotto and roasted Brussels Sprouts. Start the Risotto when the roast goes in the oven and cover to keep warm when it’s done. If it thickens, you can thin it with a couple tablespoons of hot water. Put the Brussels Sprouts in the oven when you raise the temperature to 450º. Continue roasting them while the pork rests. This way, your Risotto, Brussels Sprouts and Pork Loin are all ready to go at the same time!